The new Compact line series of HMIs from AIS combines the advantages of compact and rugged aluminum die-cast housing with an open platform HMI powered by the Intel® Celeron® processor N2930 as the processor engine. Specifically designed for industrial machinery, intelligent, web-based and smart HMI applications, the Celeron® N2930 processor is energy efficient and offers other benefits as well. The Celeron® N2930 processor was produced by Intel® as a high-powered chip that would work in a wide range of thermal conditions, making it a highly desirable solution for industrial control applications. The Intel® Celeron® processor N2930 contains numerous improvements over previous generations. Three significant improvement areas are in integration, performance, and power utilization. While lowering overall system costs greatly, using aluminum die-cast housings for AIS’s new family of industrial touch panel PC-based HMIs offers many benefits including: cost reduction, a lightweight frame, high dimensional stability, superior corrosion resistance, improved mechanical properties, high thermal and electrical conductivity, and the ability to retain strength at high temperatures. These capabilities will benefit OEMs and end-users alike in a wide cross section of industries and markets – from simple OEM discrete machines to challenging process environments like chemical, food & beverage, packaging, pharmaceutical, power generation, water/waste water and many more. 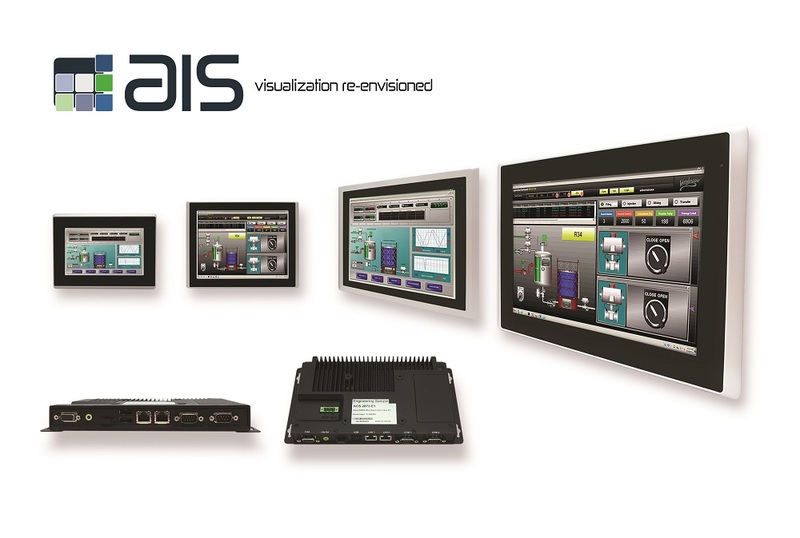 AIS’s Compact series HMIs support Open Platform Communications (OPC), Message Queuing Telemetry Transport (MQTT) and Representational State Transfer (REST), Internet of Things (IoT) protocols and web-based software necessary for industry 4.0 applications. The new Compact line family of open platform, a PC-based HMI comes in touch-screen sizes ranging from 7” to 21.5" displays with some models available in both single and/or multi-touch screens. Brochure is available in Adobe Acrobat (PDF) format, Download Today! Wide Selection of Single & Multi-Touch Screen Panels: The Compact line offers 7”, 10.1”, 12.1", 15", 17", 18.5", and 21.5” displays available in both single and/or multi-touch screens. PoE HMI Systems Provide High Reliability, Convenience, and Low Cost: Safety and Reliability: PoE is a safe power solution and protects devices from power failures. Convenience: Faster deployment of factory floor access networking infrastructures, by eliminating the need for a power outlet for every HMI device. Time/cost savings: Using one cable for both data and power to industrial devices is most cost effective, for both installation and maintenance. Automatic Battery Backup Power Module provides a cost-effective technology for mission-critical automation and control applications. AIS’s compact panel PC with built-in uninterruptible power source protects HMI/SCADA/MES systems from unexpected harmful power disruption that could cause serious business disruption and/or important data loss. 7” Compact HMI Multi-touch Panel PCs are equipped with widescreen displays that feature brilliant resolution (800 x 480, WVGA), high-brightness (350 nits), and are 100% dimmable. The system offers compact all in one panel PCs based on embedded technology, featuring Intel® Celeron® Processor N2930, DDR3L-1333 SDRAM of up to 8 GB, standard SD card slot, and Windows 7 Ultimate MUI / Windows Embedded 7 32/64-bit / Windows Embedded 8 (optional), or compact 7 OS. Other features are: highly flexible interfaces and expansions; 1 x USB 3.0, 1 x USB 2.0, 2 x GbE, 1 x RS232, 1 x RS485, 1 x HDMI, 1 x Audio and PoE PD ports (optional). 10.1” Compact HMI Multi-touch Panel PCs are equipped with widescreen displays that feature brilliant resolution (1280 x 800, WXGA), high-brightness (330 nits), and are 100% dimmable. The system offers compact all in one panel PCs based on embedded technology, featuring Intel® Celeron® Processor N2930, DDR3L-1333 SDRAM of up to 8 GB, standard SD card slot, and Windows 7 Ultimate MUI / Windows Embedded 7 32/64-bit / Windows Embedded 8 (optional), or compact 7 OS. 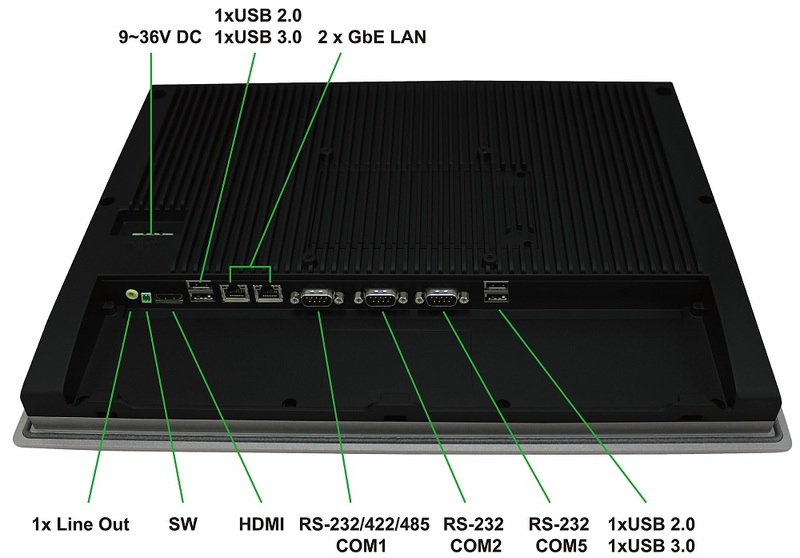 Other features are: highly flexible interfaces and expansions; 1 x USB 3.0, 3 x USB 2.0, 2 x GbE, 2 x RS232, 1 x RS485, 1 x HDMI, 1 x Audio and PoE PD ports (optional). 12.1” Compact HMI Multi-touch Panel PCs are equipped with industrial displays that feature brilliant resolution (800 x 600, SVGA), high-brightness (330 nits), and are 100% dimmable. The system offers compact all in one panel PCs based on embedded technology, featuring Intel® Celeron® Processor N2930, DDR3L-1333 SDRAM of up to 8 GB, standard SD card slot, and Windows Embedded 7, 8, or compact 7 OS. Other features are: highly flexible interfaces and expansions; 1 x USB 3.0, 3 x USB 2.0, 2 x GbE, 2 x RS232, 1 x RS485, 1 x HDMI, 1 x Audio, 1 x PoE PD ports and 1950mAh Li-ion rechargeable battery (optional). 15” Compact HMI Multi-touch Panel PCs are equipped with widescreen displays that feature brilliant resolution (1024 x 768, XGA), high-brightness (350 nits), and are 100% dimmable. The system offers compact all in one panel PCs based on embedded technology, featuring Intel® Celeron® Processor N2930, DDR3L-1333 SDRAM of up to 8 GB, standard SD card slot, and Windows 7 Ultimate MUI / Windows Embedded 7 32/64-bit / Windows Embedded 8 (optional), or compact 7 OS. Other features are: highly flexible interfaces and expansions; 1 x USB 3.0, 3 x USB 2.0, 2 x GbE, 2 x RS232, 1 x RS485, 1 x HDMI, 1 x Audio, 1 x PoE PD ports and 1950mAh Li-ion rechargeable battery (optional). 17” Compact HMI Multi-touch Panel PCs are equipped with widescreen displays that feature brilliant resolution (1280 x 1024, SXGA), high-brightness (250 nits), and are 100% dimmable. The system offers compact all in one panel PCs based on embedded technology, featuring Intel® Celeron® Processor N2930, DDR3L-1333 SDRAM of up to 8 GB, standard SD card slot, and Windows 7 Ultimate MUI / Windows Embedded 7 32/64-bit / Windows Embedded 8 (optional), or compact 7 OS. Other features are: highly flexible interfaces and expansions; 1 x USB 3.0, 3 x USB 2.0, 2 x GbE, 2 x RS232, 1 x RS485, 1 x HDMI, 1 x Audio, 1 x PoE PD ports and 1950mAh Li-ion rechargeable battery (optional). 18.5” Compact HMI Multi-touch Panel PCs are equipped with widescreen displays that feature brilliant resolution (1366 x 768, FWXGA), high-brightness (250 nits), and are 100% dimmable. The system offers compact all in one panel PCs based on embedded technology, featuring Intel® Celeron® Processor N2930, DDR3L-1333 SDRAM of up to 8 GB, standard SD card slot, and Windows 7 Ultimate MUI / Windows Embedded 7 32/64-bit / Windows Embedded 8 (optional), or compact 7 OS. Other features are: highly flexible interfaces and expansions; 1 x USB 3.0, 3 x USB 2.0, 2 x GbE, 2 x RS232, 1 x RS485, 1 x HDMI, 1 x Audio, 1 x PoE PD ports and 1950mAh Li-ion rechargeable battery (optional). 21.5” Compact HMI Multi-touch Panel PCs are equipped with widescreen displays that feature brilliant resolution (1920 x 1080, HD), high-brightness (250 nits), and are 100% dimmable. The system offers compact all in one panel PCs based on embedded technology, featuring Intel® Celeron® Processor N2930, DDR3L-1333 SDRAM of up to 8 GB, standard SD card slot, and Windows 7 Ultimate MUI / Windows Embedded 7 32/64-bit / Windows Embedded 8 (optional), or compact 7 OS. Other features are: highly flexible interfaces and expansions; 1 x USB 3.0, 3 x USB 2.0, 2 x GbE, 2 x RS232, 1 x RS485, 1 x HDMI, 1 x Audio, 1 x PoE PD ports and 1950mAh Li-ion rechargeable battery (optional).